What distinguishes a superhero from a plain old “hero” are superpowers. The ability to fly, super-strength, heightened intelligence, etc. all qualify. Otherwise you’re just a do-gooder who would likely fall victim to a Green Goblin pumpkin bomb or Doctor Octopus’ tentacles. You need honest-to-god powers to compete in this universe. After being bitten by a radioactive spider, Peter Parker gained the proportionate speed and strength of an arachnid, as well as the ability to scale walls and jump long-distances (contrary to the Spider-Man movie, in the comics, Peter was not able to produce his own “webbing.” He used his scientific know-how to engineer mechanical web “shooters”). But the superpower that always stood out to me was his “Spidey Sense.” This power was an innate warning system; if a villain was in shadow ready to strike, or a floor board Spider-Man was walking across was on the verge of collapse or revealing his position, his Spidey Sense would “tingle,” enabling him to use his lighting-quick reflexes to get out of harm’s way. When I was much younger and still trying to determine which heroes I most identified with, these distinguishable superhuman traits were vital. Superman was almost too perfect – stronger than everything, immune to bullets with only one real weakness, a foreign substance from his home planet called kryptonite. Sure, villains always found a way to procure kryptonite to keep things exciting, but as a kid, I viewed Superman as indestructible, even when DC inexplicably tried to kill him in the 1990s. I was also never able to get behind superheroes with projectile powers — i.e. shooting fire, ice or water (thus negating a number of the X-Men). It felt like cheating to me. When the going got tough, they were able to lean on the power of the elements to get out of trouble. Plus those were the kinds of powers reserved for super villains. It was up to the superheroes to outsmart the villains, not match power for power. You could throw physical freaks of nature like The Hulk and The Thing in a similar boat. Yes, Spider-Man has strength, but as you might recall, when he was buried under tons of steal and wreckage in ASM #33, there was serious doubt on the reader’s end that he’d be able to power his way out. It took every last ounce of strength and determination for him to succeed. Superheroes like The Hulk and The Thing seem to get by just on brute strength. In the Ang Lee Hulk movie a few years ago, the green guy was swinging tanks around like they were baseball bats. That’s just not fair. But Spidey Sense is both simultaneously beyond the realm of imagination and realistic. While it’s a clear advantage for Spider-Man, it’s a power that makes sense — a spider is comparatively strong and fast in the insect kingdom, but a key part of its survival is its ability to elude danger. How hard is it for a person to sneak up on a spider? If you’re looking to squash one, you generally need the help of a newspaper or something broad. And yes, just because Spider-Man had his Spidey Sense, doesn’t mean he never got hit. In the comics, he gets beat up on a regular basis. But the Spidey Sense still gives him at least some kind of an edge headed into a fight. Spider-Man still has to use his intellect and speed against characters like Electro who can control electricity or Sandman, who’s more immune to physical damage because he’s made of sand, but the Spidey Sense gets him in a position to succeed. And the Spidey Sense also helped Spider-Man vanquish perhaps his greatest villain of all time, the Green Goblin (before Marvel brought him back to life in the 1990s, but let’s not get into that right now). After a knock-down fight in ASM #122, Spider-Man starts to close in on the Goblin when the villain summons his Goblin “Glider” to act like a guillotine and slice Spidey in half. Spider-Man’s Spidey Sense tingles and he’s able to dodge the sneak attack, leaving the Goblin to get the sharp end of the stick. So you can imagine my shock when I opened up the latest offering from Marvel, ASM #656, and saw that Spider-Man had LOST his Spidey Sense. 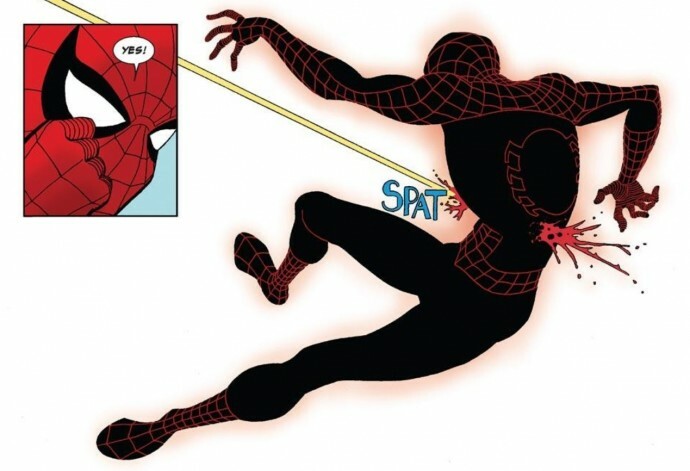 Due to an explosion a few issues earlier that essentially neutralized this one ability, Spider-Man goes to take on a new villain in this issue and in a panel that just made my jaw drop to the floor, he’s successfully pierced by a bullet due to his inability to dodge the attack (don’t worry folks. Spider-Man lives because of his ability to heal at a superhuman rate). 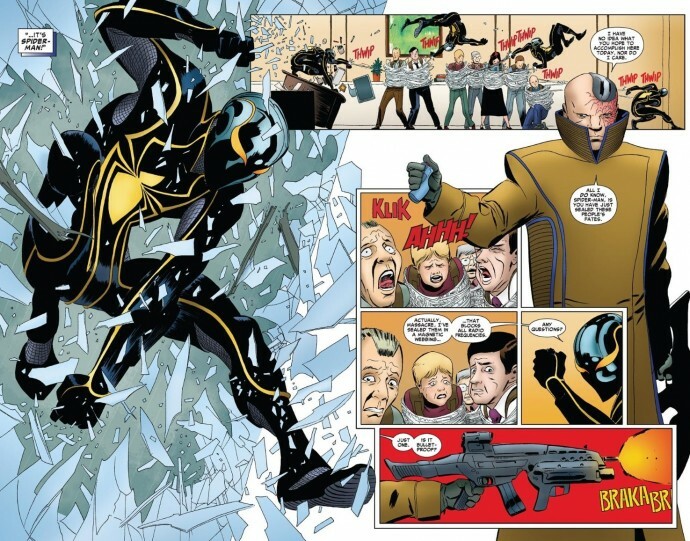 While I already admitted that Spider-Man was subject to getting beaten down regularly, standard bullets from the “criminal element” of the Spider-Man universe were usually minor annoyances because of the Spidey Sense. This plot development is just not sitting right with me. Of course, we get to see Peter’s ingenuity on display when he countered his lost power by developing a new bullet proof suit. Yeah. A new suit. Points for trying, and as an academic-type myself, I’m always a fan of Peter using his brain to outwit the opposition, but now Spider-Man is bordering on becoming Batman or Iron Man, where an endless stream of new technology will help him adapt. 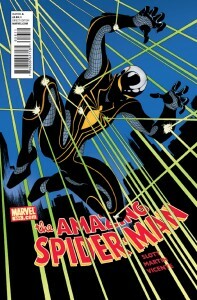 If Spider-Man always had the ability to build a bullet-proof suit, why didn’t he have one from the issue’s early days? Sure the Spidey Sense and reflexes help, but why not build into his costume every advantage possible? Because the premise behind Spider-Man has always been that he would use his accidentally-gained powers to do good. 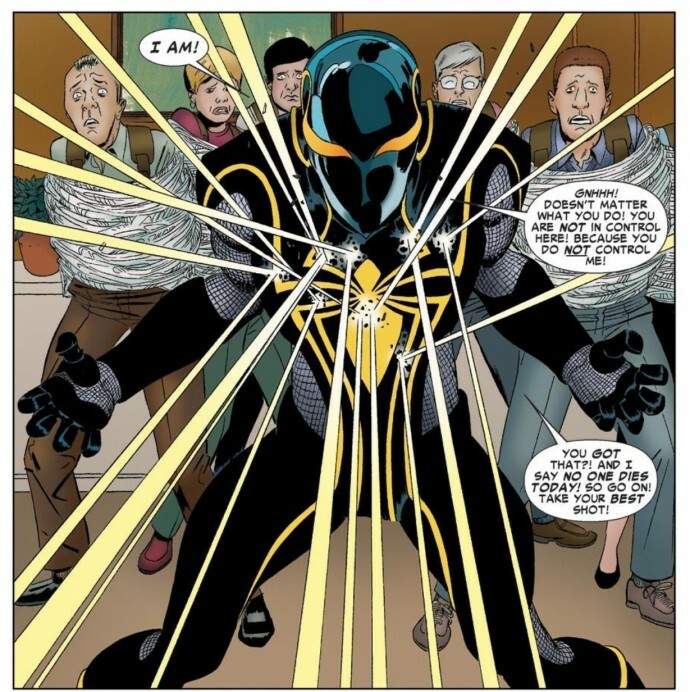 When ever Spider-Man faced off against his foe Venom, his Spidey Senses were neutralized because of the alien symbiotic suit that Venom was wearing (which previously belonged to Peter). But you never saw Spider-Man take on Venom by tricking out his suit like a Cadillac with 22-inch chrome wheels or by matching might with might. He outsmarted him, despite one of his powers being neutralized. As I said earlier, I want to try avoid using these entries to critique the writing of a specific Spider-Man issue, past or present, but I also do hope this new development for Spider-Man is a short-lived one and not some kind of redefining of the character. It’s one thing to try to update a character for a newer audience, or to introduce new villains with crazier powers, or even bring back old ones with makeover. But things like a superhero’s superpowers are part of the heart and soul of a comic book series. They’re sacred. To change them on a whim like this without a indisputably valid reason is a tough pill to swallow. 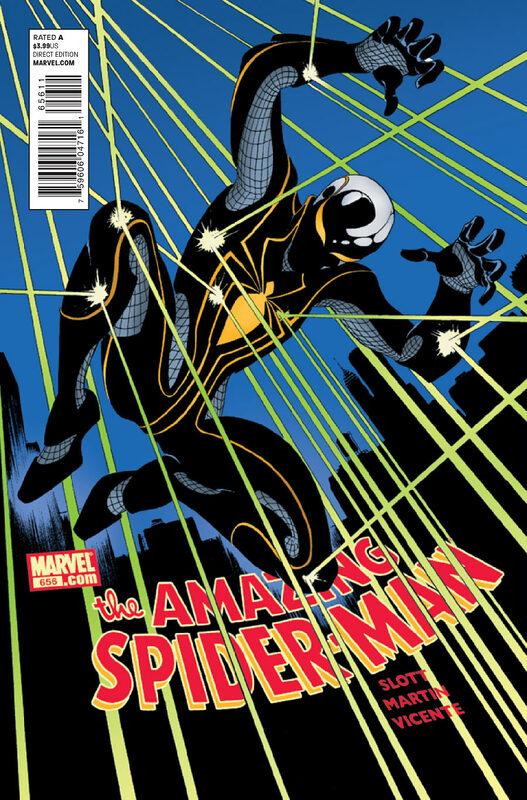 Granted, as with anything, a reader has to give these kinds of editorial decisions time to play out, but if the end result of Spider-Man losing one of his most unique and classic powers is a new bulletproof suit, I think that would be borderline heresy. first off i love the site. Second i think u are looking at this thing from the wrong side. it isnt greed thats prompted this new variant cover its survival. people just dont buy comics anymore and comic retailers are a dying breed. my personal store is on the verge of closing. im a reader first and not a collector. so i read a couple issues of a writer i like and then skip out to a different comic. so a subscription is not a workable plan for me. like u i want to feel the paper so digital is out. and the grocery stores only carry the mainstream stuff. great if u like spiderman but if u want an issue of punisher your not gonna find it. i could order on a website but then i miss out on flipping through the comics to find that gem i didnt know existed. so for me its the shops or bust and they are a dying breed with all the aforementioned options of today. And yes you do have those unscrupulous owners that overprice but most places are very honest and just want to help you get what you want. So i think as a whole this could be good for the industry who without which we wouldnt have any comics anymore. Also the writer of Ultimate Spiderman is very good. You might try the trade of his version of the clone saga. And this is coming from someone who doesent really care for Spiderman. Sure he is using a gimmick to draw people in but he usually delivers inside the comic as well. He shows you the shiny object to get in the tent and then puts on a great show. I apologize for the grammatical errors im writing this from my phone and i have fat fingers. 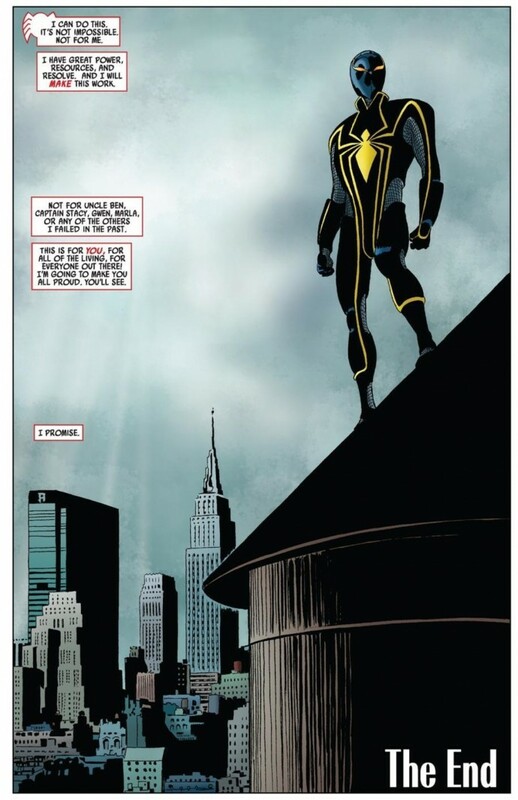 In defense of Peter Parker’s mind, why not (inventing the suit) before? My guess: too busy feeling guilt for his life, past and yet trying to be happy with someone (MJ) and keeping his family and friends alive and away from harm. Too much of everything around him made him forgot himself; psychologically, that really does happen. Enter the new century, Joe Quesada, J. Michael Straczynski and the new Marvel order. Peter Parker has to evolve. So slowly, a teacher; an avenger; aunt May knows; MJ back. New opportunities.The spiritual spider-totem sel-learning curve. More time to learn about himself. Therefore, new doors inside are open – and his universe is responding accordingly. 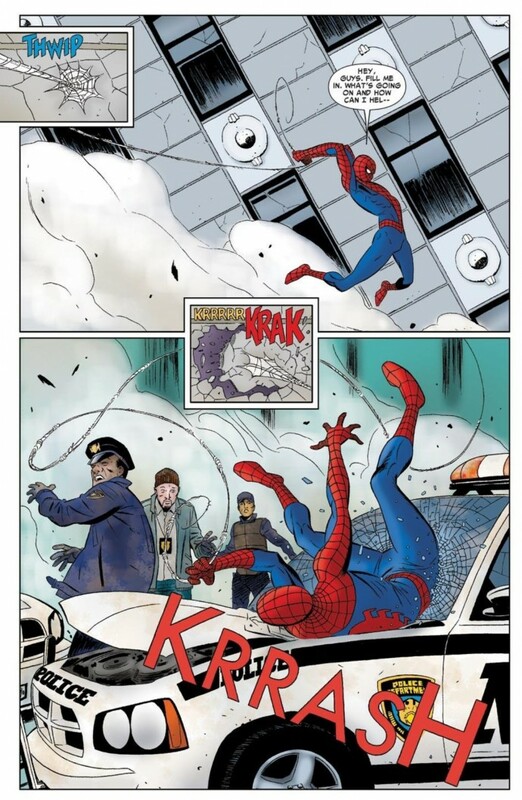 To me, Dan Slott – despite his good work on the title -, is only reinventing the Ditko/Lee/Romita phase using the tools that JMS placed: new concepts and a new life for Peter Parker. But Marvel Now(!) is all about ‘what is old is new again’. And the old concepts have to be stretched and placed in our reality for a proper identification and placement. At this day and age, we’re all about technology. Why wouldn’t Peter have such chance as well?